With garden crops in abundance these days it is time to think about what to do with all of your extra produce. Here are our favorite Ways To Use Extra Tomatoes From Your Garden this summer. Some classic dishes, a few new spins on classics and of course some canning or freezing involved. Don’t let the extra tomato crop become a problem this year. Use some of our great ideas from years past for your extra produce this summer. BARTER WITH NEIGHBORS AND FRIENDS. Use your fresh garden tomatoes as a platform to barter for other produce you didn’t grow this year or share in exchange for things like babysitting or cleaning your house. Tons of people would love to have fresh produce in exchange for something they can do for you. HOME MADE PASTA SAUCE. Nothing is better than opening a jar of your own home made marinara or pasta sauce. Save money on spaghetti night by planning ahead and making your own canned tomatoes or tomato sauce. Grab a pressure cooker, mason jars and your grandma’s notes on canning and enjoy the feeling of making your own sauces to share with others too. GRILL THEM. Want a little different taste profile? Slice your tomatoes into 1/2” steaks, drizzle with olive oil, salt and pepper and grill for 2-3 minutes on each side. Perfect for adding to sandwiches and burgers. These are also great for dicing and going into salsas, sauces or salads. STUFF AND BAKE. Do you love stuffed peppers? Why not make a stuffed tomato instead? Hollow out a tomato and fill with a mix of meat, cheese and onion for a tasty dish. SLICE OR DICE AND FREEZE. Want tomatoes in a pot of stew, chili or soup? Grab a bag of fresh from your freezer year round. Simply wash, pat dry and then slice or dice and freeze. These work great for going in stews, soups and sauces. Not so great for sandwiches though. Invest in a food storage system for ultimate storage in the freezer. Not only will flavor be better overall, the fruit will last twice as long as traditional methods. FEED THE HOMELESS. What better way to give back to those in need than by providing them with fresh grown produce? Many shelters, soup kitchens and food pantries rarely have fresh garden produce to give to those in need. Load up a few bags and take to your local soup kitchen or hand deliver to ares you know have people in need. There is so much more you can do with fresh garden produce than simply slicing to go on sandwiches. 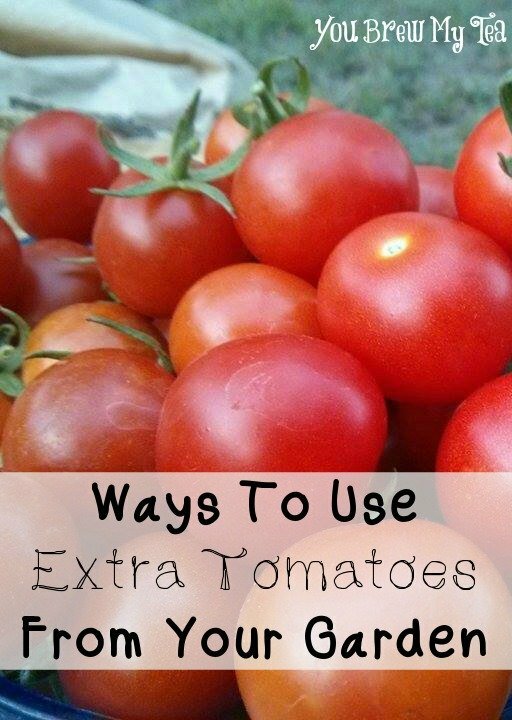 These ways to use extra tomatoes from your garden are sure to please your whole family and leave you feeling good about what you grew this year.